A California City firefighter makes his way to safety after stoking some flames to simulate an aircraft crash site April 4 in California City, California. The scene was part of a joint training exercise between Edwards Air Force Base and fire departments from Cal City, Bakersfield and Kern County. 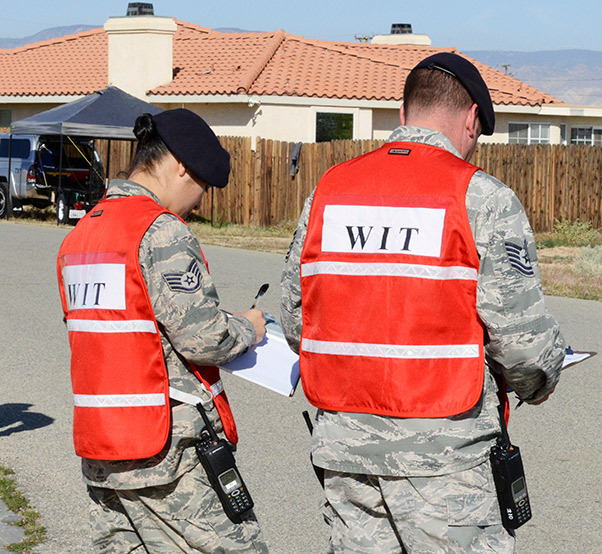 CALIFORNIA CITY, Calif.–Four community agencies joined Edwards Air Force base emergency responders for Exercise Desert Wind 16-02 April 4. The scenario for this training exercise was a crash involving a United Kingdom F-35 based out of Edwards. The crash site was in the middle of California City, 20 minutes north of the base. 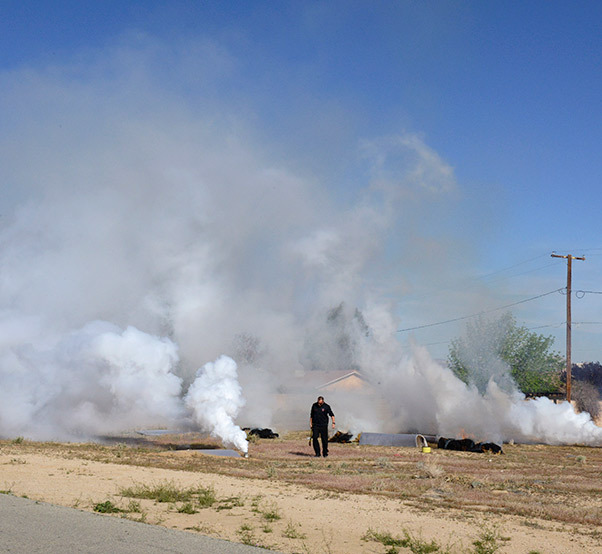 The Edwards Fire Department, Explosive Ordnance Disposal, Inspector General Office and Emergency Management, partnered up with the California City Police and Fire Departments and the Bakersfield and Kern County Fire Departments. Fire fighters treat a “wounded” civilian April 4 during Exercise Desert Wind 16-02. To make the exercise as realistic as possible, fake wounds were applied to volunteers and fire and aircraft parts were set at the “crash” scene. 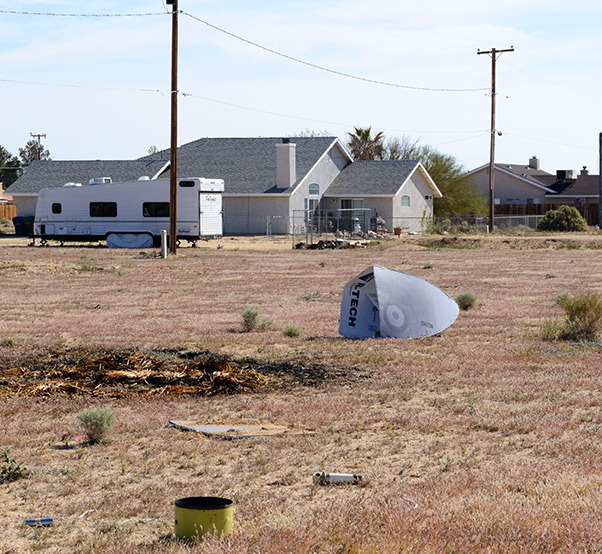 The scenario was a Royal Air Force F-35 crash in the middle of California City. 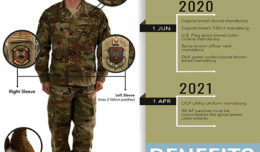 In a real world emergency, local agencies will be the ones first on the scene so it’s important for military responders to have clear communication and coordination channels with those agencies. Simulated 911 calls began at 9:10 a.m. reporting a downed fighter jet of some sort. California City Police arrived at the scene on Karen Ave. followed by all three participating civilian fire departments. What they encountered were fires, debris and “wounded” citizens. Back at Edwards, Crisis Action Team and Emergency Operations Center members were immediately recalled to their stations while reports from off base were coming in. 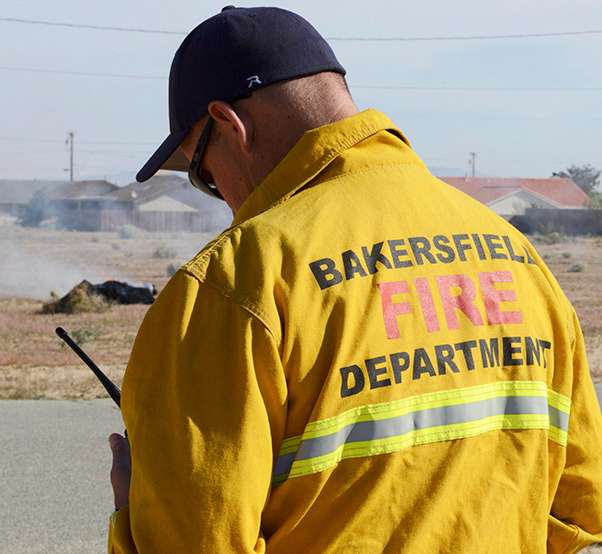 Fire departments from Bakersfield, California, California City and Kern County participated in Exercise Desert Wind 16-02 April 4. 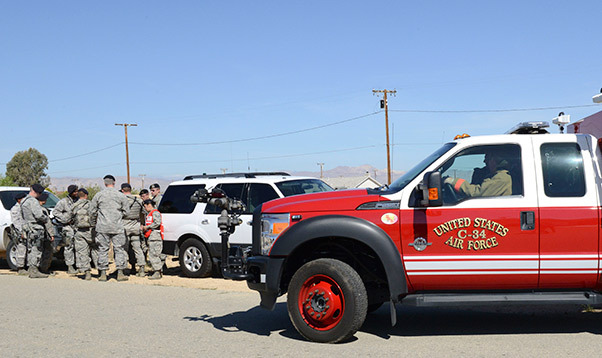 Once the initial fire and victims were treated, the civilian responders turned the scene over to Edwards AFB Fire Department and emergency responders while defenders from the 412th Security Forces Squadron cordoned off the area. Fighter jet crashes pose an exceptional risk when responding because of special hazards such as weapons and chemicals that can be present at the crash site. Members of the Wing Inspection Team observed the onsite procedures, while back at Edwards, the Crisis Action Team and Emergency Operations Center communicate with the responders and make decisions on the way forward. The 412th Test Wing performs several emergency response and readiness exercises throughout the year to ensure that if an accident or disaster does happen, emergency responders and base officials are ready to tackle the situation with proper actions and procedures. To make the exercise feel as real as possible, controlled flames were set, smoke devices were set off, and aircraft parts were strewn along the ground. As Bakersfield fire fighters treat a “wounded” civilian, a Kern County Fire Department engine arrives. 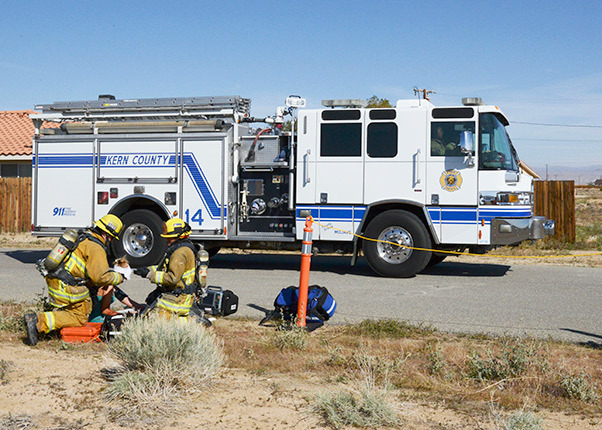 Edwards Air Force Base partnered with three different fire departments in the local area April 4 during Exercise Desert Wind 16-02. 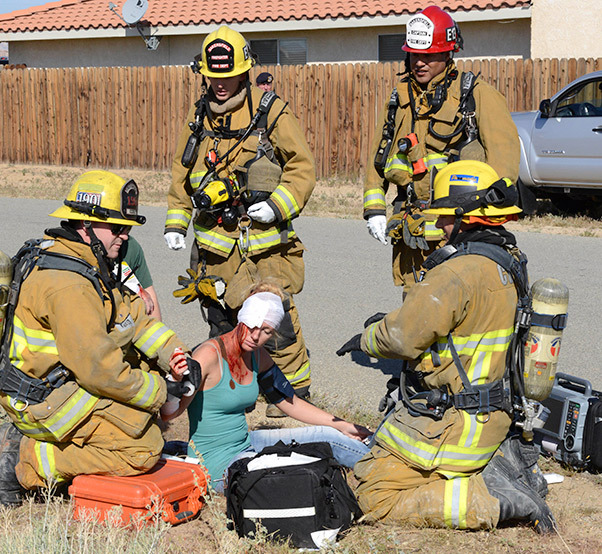 The emergency response exercise took place in California City. Members of the 412th Test Wing Inspection Team observe and document the response during Desert Wind 16-02 April 4. 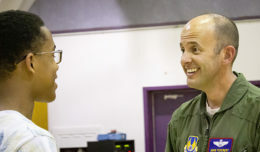 The emergency response exercise took place in California City and involved several agencies helping Edwards AFB during a simulated aircraft mishap. An Edwards Fire Department vehicle arrives at the scene of a simulated crash. If a crash were to occur off base, local emergency responders would be first on the scene and Edwards emergency responders would arrive to help.